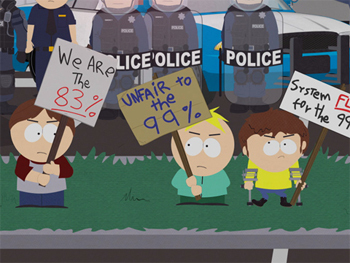 Last week South Park took a stab at the #Occupy movement in the 1% episode; and as usual they hit the nail on the head in satirizing the inherent generalization of the 99%. With media posed to exploit any occupation they can find, South Park’s lesser known fast food hangout becomes the scene of #OccupyRedRobin in protest of the Presidential Fitness Test. But all satire aside, the best part of this episode? It’s all about Cartman. Cartman is one of the most charismatic people in South Park, with a deeply twisted dark side that sickos like myself find SO endearing. It really shines in this episode, where South Park elementary has a new reason to hate on Cartman. His low score on the presidential fitness test has dragged the school’s average down to the lowest score in the country. Now, the entire school is being forced to take Phys-ed during recess… all because the 1% (Cartman) didn’t accept responsibility, thus affecting the 99% (every other student)… get it? Derp. Of course, according to Cartman this is ALL Obama’s fault; he’s the president, he set up the test system, and because he’s black no one will blame him for anything. In fact, Cartman is beginning to feel like everyone is ganging up on him (the 1%) unfairly, and he becomes worried that the 99% are somehow out to get him. The other kids in his class just tell Cartman to stop complaining and grow up; and an off the cuff remark from Craig, “Yeah, why don’t you go home and cry to your stuffed animals again?” sets the whole episode in motion (wait for it). Though they blame Cartman for his part in the test score, Butters and Jimmy see that the system itself is flawed and go to the test administrators to lodge a complaint. “All the students know who the 1% is; you’re just making the 99% more angry,” warns Jimmy; but since no one will listen he decides it is time to form a protest. As a result, Butter and Jimmy accidentally ignite the #OccupyRedRobin movement, and the opportunity is instantly seized by the media. All the while, Cartman has been obsessing over the altercation at school, becoming convinced that the 99% are out to get him. This is only reinforced when Clyde Frog, his beloved stuffed animal, turns up dead. At the funeral, Cartman makes an impassioned speech against the 99%’ers, claiming that they have now resorted to murder and must stop blaming the 1% for what is CLEARLY Obama’s fault. But the next night, someone sets Cartman’s room on fire and Peter Panda is ‘killed’ in the blaze. Meanwhile, the #OccupyRedRobin movement in South Park is veering off-course. When one occupant is asked what they hope to accomplish from the movement, he replies, “I like the A1 peppercorn burger.” Nevertheless, media and law enforcement are taking the occupation VERY seriously, and soon new group joins in… the 83%. To clear up the math… Cartman (in the 4th grade class) is the reason all students were forced to give up recess. So Steve Tamil, representing the other classes – the 83% – is now protesting the 4th grade class – the 17% … and that is just how stupid class warfare can be, kids! But in South Park, this is all a very serious matter. Cartman is taking it very seriously; fearing for his stuffed animals and own life, he moves in with Token. Besides being Cartman’s wealthiest friend, Token is black; and Cartman reasons that he can trust him, because black people are incapable of doing anything wrong these days. Paranoid and certain that the 99% are going to get him, Cartman soon turns against his friends and even Token – amidst which his other toys go missing. What follows is a steep decent in to the mouth of Cartman’s madness… He first finds Muscle Man Mark, boiled alive; then Rumpletumpskin is strung up and decapitated. Finally to his horror, Cartman discovers Polly Prissy Pants, the only toy he has left, was behind the entire massacre. Her plan was to frame Token, but Cartman points out that black people can’t be blamed for anything these days (again, Obama). 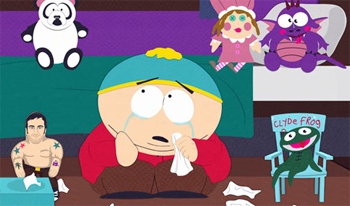 With no other choice, Cartman shoots his beloved doll in the head (and then 5 more times) before he breaks down crying. What I love about this episode is the moment the camera pans back to reveal his friends, mom and Token’s parents watching in horror. We all know Cartman is crazy, but South Park never fails to up the ante on his psychosis. His elaborate plot is kind of genius; it allowed him to get rid of his stuffed animals without any guilt and kind of ‘grow up’. But of course it had to be South Park style, offending at least one race and one political movement in the process. Good work, South Park.. now get down to State Street! They’re occupying Macaroni Grill! Pingback: Corina’s Cartoon Cuts: Futurama AND Aqua Teen Hunger Force Return « Biff Bam Pop! Pingback: Corina’s Cartoon Cuts: Robot Chicken Season 6 and More « Biff Bam Pop!